Another recipe for the College Cookbook…(come on – a kid can’t eat ramen all the time!). The taste testers in my house were loving this one! You can eat it as is or pile it on a crusty bun for a knockout sandwich! Double up the recipe and share with your roomie – or add a great side like pasta or rice and it makes date night delish! Heat skillet to 300 degrees, add butter & olive oil. Season chicken & mushrooms with garlic powder, salt & pepper. 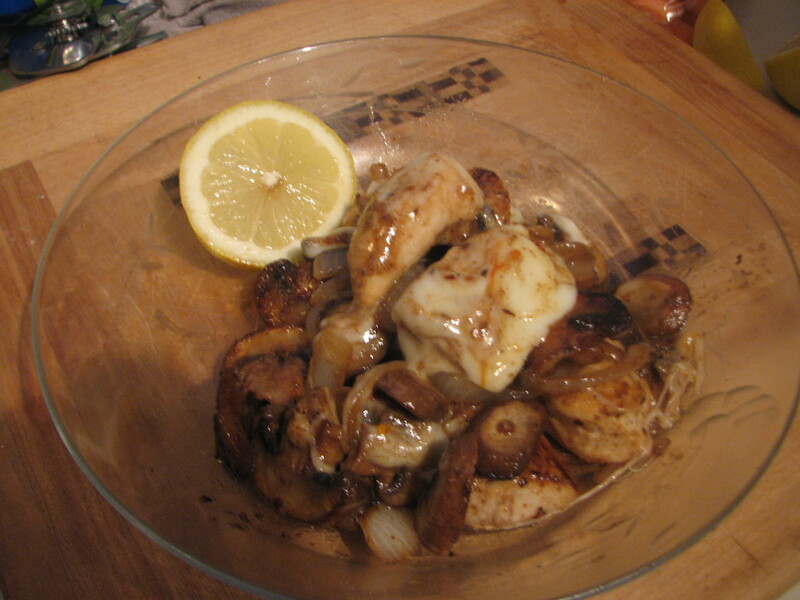 Add onions, sauté 1 minute then add chicken & mushrooms. Toss all until brown on all sides – about 5 minutes. Add lemon juice and pepper flakes if you like it kicked up! Sauté 1 minute – push everything together, turn off skillet, top the pile of goodness with two slices of your favorite cheese (experiment and see which you like best!) – cover the skillet for one minute until cheese melts. Put on a big bun for a wonderful sandwich or eat just like it is with a side salad or veggie!